First, let’s determine your eligibility to file Form I-751. These initial questions will quickly determine if you are eligible to file a petition to remove conditions on residence. My marriage to a U.S. citizen or permanent resident. My parent's marriage to a U.S. citizen or permanent resident. 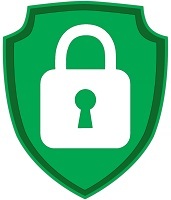 A financial investment in a U.S. business. If you became a conditional resident based on a financial investment in a U.S. business, file Form I-829 Petition by Entrepreneur to Remove Conditions. How will you be filing? If you select this option, you should be presently married to the spouse through whom you gained your conditional residence. If you are no longer married to (or are otherwise separated from) the original petitioning spouse, you must file individually with a request that the joint filing requirement be waived. If you select this option, it is because you cannot file jointly with the spouse through whom you gained your conditional residence. Generally, a petitioner is not able to file jointly because he or she is no longer with the original petitioning spouse due to divorce, death, separation or abuse. Due to the complexities of these cases, we highly recommend you speak to an immigration attorney before filing Form I-751 with a request that the joint filing requirement be waived. Your answer suggests that your case may be complex enough to require the guidance of an attorney. Before you continue, CitizenPath recommends that you consult with an experienced immigration attorney. My spouse is deceased. I entered the marriage in good faith, but the marriage was terminated through divorce or annulment. I entered the marriage in good faith, and, during the marriage, I was battered, or was the subject of extreme cruelty, by my spouse. The termination of my status and removal from the United States would result in an extreme hardship. You may select all reasons that to your situation. Are you and the spouse through which you gained conditional residence still married? You continue to be married until granted an annulment or divorce decree. For your information: USCIS will only adjudicate your petition if the divorce or annulment is final. Generally, this means you need to wait to file Form I-751 until the court provides the annulment or divorce decree. However, some attorneys may advise their clients to file Form I-751 even if the divorce or annulment is still pending. If you have been advised to file your I-751 petition anyway, you may continue. If you select this option, it is because the child cannot file jointly with the parent’s spouse through whom he or she gained conditional residence. Generally, a child petitioner is not able to file jointly because the child’s parent is no longer with the original petitioning spouse due to divorce, death, separation or abuse. My parent's spouse is deceased. My parent entered the marriage in good faith, but the marriage was terminated through divorce or annulment. My parent entered the marriage in good faith, and, during the marriage, I was battered, or was the subject of extreme cruelty, by my conditional resident parent or parent's spouse. The termination of my status and removal from the United States would result in an extreme hardship. You may select all reasons that to your situation. Are your parent and the spouse through which you gained conditional residence still married? They continue to be married until granted an annulment or divorce decree. When did the marriage end? Provide the date of the divorce or annulment. If the marriage ended due the death of a spouse, provide the date of the death. When does your green card expire? It already expired. It has not expired, but it will expire before mm/dd/yyyy. It has not expired, but it will expire after mm/dd/yyyy. Look at the front of your green card. It indicates when the card expires. It is currently more than 90 days before your card expires. When filing Form I-751 jointly with your spouse, you must file during the 90-day period immediately before your conditional residence expires. You may continue preparing this form, but do not mail it to USCIS before the 90-day window. Your card is expired. By failing to file I-751 before the expiration date, you are removable from the United States. Before you continue, CitizenPath recommends that you get a consultation from an experienced immigration attorney that can assist you with this matter. 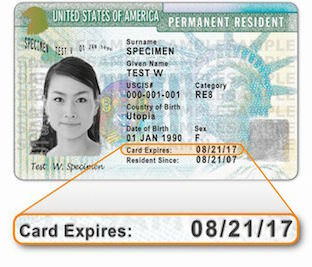 You can find your expiration date the front of your Permanent Resident Card (green card). Are you in removal, deportation, or rescission proceedings? Removal, deportation, and rescission proceedings are similar terms to describe a situation that you must appear before an immigration judge and your immigration status is being challenged. As such, the U.S. government is putting you in a legal process to remove you from the United States. If there is a possibility that you have ever been in removal, deportation, or rescission proceedings, CitizenPath recommends that you contact an immigration attorney before continuing. Your answer to this question suggests that you have a history which may require the assistance of a legal professional. We want the best result for you, and therefore CitizenPath suggests that you consult with an experienced immigration attorney that can provide you with additional guidance and representation. Was a fee paid to anyone other than an attorney in connection with this petition? You must disclose if money was paid for anything other than the preparation of this petition. USCIS wants to make sure that your marriage was entered in good faith. Have you ever been arrested, detained, charged, indicted, fined, or imprisoned for breaking or violating any law or ordinance (excluding traffic regulations), or committed any crime which you were not arrested in the United States or abroad? A misdemeanor or felony criminal offense can potentially affect the success of your petition. Even if you have been arrested for a DUI (driving under the influence) or minor crime, you should truthfully answer this question. Even if your green card was issued since the crime, the treatment of a crime in immigration law may have changed. If your history includes a criminal offense, please contact an immigration attorney before filing any USCIS forms. Congratulations, you're likely eligible to remove the conditions on residence. Please click on "Next Page" below to continue your petition. Let’s get started with some information about you, the Conditional Resident. Have you ever used another name (such as a maiden name)? USCIS asks for variations of your name. It is important that you provide all versions of your name to avoid confusion and maintain consistency with other legal documents. 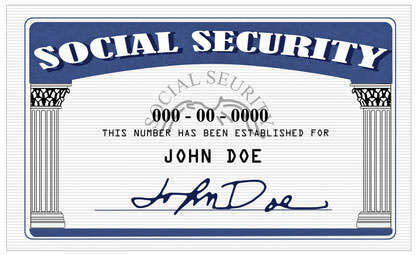 Your current legal name is the name that identifies you for legal, administrative and other official purposes. Many people’s legal name is the name that appears on their birth certificate, but it may have changed through marriage or another form of legal name change. Are you (the conditional resident) living overseas due to military service or government orders? If you reside overseas because of military service or government orders, indicate Yes. Enter the physical address is where you live now. Provide a complete address. Do not use a Post Office address (P.O. Box) here. Have you resided at any other address since you became a conditional resident? Indicate if you have lived at any other address since you were granted residence. List each address that you have resided since becoming a conditional resident. Enter the dates at each address. Is your mailing address different than the Current Physical Address that you listed above? Your mailing address is where you prefer to receive mail. If your mailing address is different than your physical address, check “Yes” and answer the follow up questions. Your mailing address is where you prefer to receive mail. If your mailing address is different than your current physical address, list your complete mailing address in the spaces provided. This may be a Post Office address (P.O. Box) if that is how you receive your mail. What is your current marital status ? Please select... Married Divorced Widowed Select the marital status you have on the date you are filing this petition. If you are separated, select "Married." Separation means that you are living apart from your spouse, but you're still legally married. Please select... Married Single Divorced Widowed Select the marital status you have on the date you are filing this petition. If you are separated, select "Married." Separation means that you are living apart from your spouse, but you're still legally married. Enter the place (city, state, country) of your current marriage. Is your current marriage different than the marriage through which conditional residence status was obtained? To file this petition jointly with your spouse, you must be together with the spouse through which you initially acquired conditional residence. If you are no longer with the spouse through which you acquired conditional residence, you must file Form I-751 with a hardship waiver. Due to the complexities of these cases, we highly recommend you speak to an attorney before filing Form I-751 with a hardship waiver. You're making good progress. Let's continue. As you may have noticed, Hispanic/Latino is provided as a choice for ethnicity, but it is not provided as a choice for race. This is because USCIS (and the U.S. government) do not define Hispanic/Latino as a race. For race, you must choose one or more of the values provided in the list. There is no wrong answer. You may answer the question with the race(s) you most closely identify. Applicants from Cuba, Mexico, Puerto Rico, South or Central America, or any other Spanish culture or origin should choose the race(s) that fits best for your situation. Many Hispanic applicants select “white” but others choose “black” or “American Indian.” (You may choose more than one.) There is no one single answer that works for all Hispanic people. The answer is individual to you. Select the boxes that best describe your race. There is no wrong answer. You may answer the question with the race(s) you most closely identify. Select the box that best describes the natural color of your eyes. Select the box that best describes the natural color of your hair. Select the country where you were born. If your country isn't listed, choose "Other" at the bottom of your list and type your country in the space provided. Select the name of the country where you are currently a citizen or national. If you are stateless, select the name of the country where you were last a citizen or national. If you are a citizen or national of more than one country, select the name of the foreign country that issued your last passport. 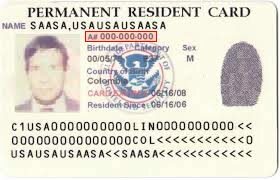 Also known as an A-Number or USCIS#, your Alien Registration Number is an 8- or 9- digit number that can be found on your Permanent Resident Card (also known as a green card). 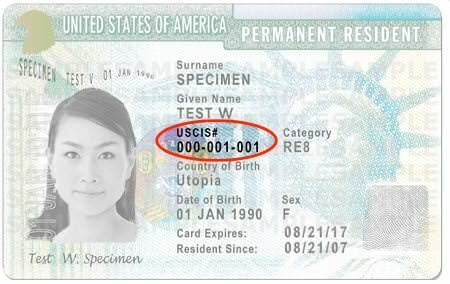 In this green card example, the A-Number is listed as “000-001-001” underneath USCIS#. If your card is lost or missing, you can also find your A-Number on other immigration documents such as an I-797, Notice or Action, or Employment Authorization Card (work permit). USCIS will process your petition in the USCIS online filing system. The USCIS online account number is not the same as an A-Number. If you were issued a USCIS online account number, enter it in the space provided. If you do not have an account number (or do not know), you may leave it empty. If you choose not to access your USCIS online account, USCIS will still process your petition in the USCIS online filing system. You will also receive notifications and updates about your petition by mail through the U.S. Postal Service. Nice job! You’re half way there. Let's get some information about the petitioning U.S. citizen or permanent resident. Complete this section to the best of your ability. If you truly do not know the answer to a question, "unknown" is an acceptable answer. My spouse or former spouse. My parent's spouse or former spouse. Is this person currently serving with or employed by the U.S. government and serving outside the United States? Enter information about the petitioning spouse through whom you gained your conditional residence. Spell out middle names completely and do not use just the initial. If the spouse doesn't have a middle name, you may leave this field blank. Enter information about the step parent through whom you gained your conditional residence. Spell out middle names completely and do not use just the initial. If the step parent doesn't have a middle name, you may leave this field blank. Is this person living at the same address as you? A married couple that is filing a joint I-751 petition will generally be living together in the same residence. Living at different addresses could be a red flag for USCIS to question the validity of the marriage. Before filing I-751, CitizenPath recommends that you speak an experienced immigration attorney that can assist you with this matter. Good work! It's all easy from here. Next, the petition requires information about your children, even if they are from a previous marriage. Generally, USCIS considers children to be any biological, step, or adopted dependents under the age of 21. See the full USCIS definition. List all of your children in this section, even if they are from a previous marriage. If your dependent child acquired conditional residence on the same day as you or within 90 days thereafter, you may include him/her on this same petition. Any children that acquired conditional residence outside of the 90-day window must file a separate Form I-751 to have conditions on their status removed. Do you have any children (under age 21)? Is this child applying with you? Is this child living with you? Please answer a few more questions to complete your petition. Are you requesting an accommodation because of a disability and/or impairment? USCIS is committed to providing reasonable accommodations for qualified individuals with disabilities and impairments that will help them fully participate in USCIS programs and benefits. Reasonable accommodations will vary based on each individual’s disability or impairment. However, if you believe that you need USCIS to accommodate your disability and/or impairment, indicate “Yes” where applicable and describe the accommodation you require. Even if you simply need a wheelchair, indicate the need so that USCIS can prepare and ensure a wheelchair-accessible room is available for your visit. If you require more space than available here, please provide the information on a separate sheet of paper and attach it to your application. Write your A-Number at the top of each sheet. USCIS considers requests for reasonable accommodations on a case-by-case basis and will use its best efforts to reasonably accommodate all individuals with disabilities or impairments. Qualified individuals will not be excluded from the participation in, or be denied the benefits of, USCIS’ programs solely on the basis of their disability(ies) or impairment(s). Requesting and/or receiving an accommodation will not affect your eligibility for a USCIS benefit. Because of my disability(ies) and/or impairment(s). For my spouse because of his or her disability(ies) and/or impairments. For my included child(ren) because of his or her (their) disability(ies) and/or impairments. Did the conditional resident or the petitioning spouse receive help from an interpreter to prepare this petition? Did you receive help from an interpreter to prepare this petition? Which foreign language was used? Indicate if someone other than the conditional resident or spouse prepared this petition. Please select... I am a petitioner, and I completed this petition. I am not an attorney or accredited representative but have prepared this petition on behalf of the petitioner and with the petitioner's consent. I am an attorney or accredited representative of the petitioner that prepared this petition. Please select... Extends beyond the preparation of this petition. Does not extend beyond the preparation of this petition. Does your credit card have a U.S. billing address?